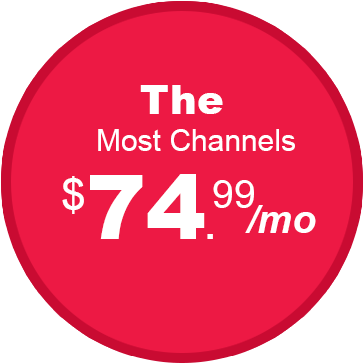 For the special price of only $74.99/mo for 12 months you get over 290+ of the most popular all-digital channels! With channels like TNT, the Disney Channel, TBS, ESPN, the History Channel, A&E, and AMC, our Top 120 package is perfect for families that want to get right to the very best channels at a very low cost every month. Our Top 120 package includes all of the channels that you want, like the Home Shopping Network, ION, ABC Family, and more, while keeping your monthly television bill well within your budget. If you like what you see, you can also upgrade at any time to take advantage of our Top 200 and Top 250 packages as well. Want to make sure you never miss a second of your favorite shows, or a single play by your favorite team? Our whole-home DVR solution, the Hopper, is included free of charge for everyone that takes advantage of our Top 120 package. With the Hopper, you can record live entertainment, movies, television shows, and more, all in high quality HD that will look and sound fantastic. Best of all, you can watch your favorite programming anywhere in your home, giving you the freedom to decide when and where you want to enjoy some of your favorite channels. With the Top 120, there's finally a package everyone will love.